Perfect blend of Nature with mystical mountains awaits you to explore........... a trek to remember..!!! Manaslu region trek is said to be the most popular and the most loved trekking route among the trekkers visiting around to this beautiful country, Nepal. The spectacular mountain views and the enchanting scenery of the landscapes as well as the people and its rich culture are something that adds up a prime focus to manaslu area. This place is situated 8156m above sea level and is one of the perfect blends of natural beauty and the biological diversity. Manaslu being known as the The spirit Mountain in local language is the eight highest peaks in the entire world and is situated Gorkha district of Nepal. This undoubtedly, an ecstatic place should be visited by every one for the once a life time experience. If anyone wants to plunge into the breath taking mountain scenery than the circuit of Manaslu via the Larkya La is the best option to eye feast. One can start the trekking journey after driving to Sotikhola (815 m.). The flora and fauna residing on the trails are mesmerizing as one gets to further ahead to Labu Besi (900m) and then to Jagat (1250m). Movign ahead, one reaches to Ngyak (1950m) and then to Ghap enjoying the amazing scene residing on the path. Passing through the many beautiful places like Lho, Samagompa, Samdo one reach to Dharamsala where we rest and it is good for acclimatization too. Ascending up to the Larkya La pass (5213m) after the comfortable rest, we treks down to Bhimtang (3890m) and then to Tilje,Tal, Syange and finally coming to the Besishar ends the marvelous Manaslu trekking. Thus, returning back to the Kathmandu concludes the overall journey. During the trekking, one can get to experience the different ascending and descending path and the forest and villages residing by. The people inhabited in this area are warm and friendly. Their hospitality makes you feel as you are in the home area. Come and join us for the adventurous and exciting trek to this amazing wonderland. This mountains land is full of natural beauty and is worthwhile to explore. Let, Himalayan Joy Adventure serve you for the best trekking adventure ever. 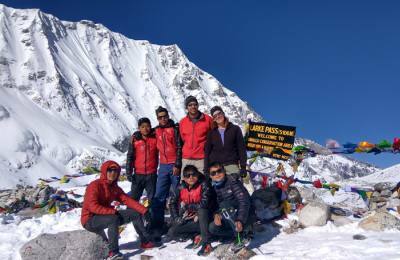 Our qualified team of guide and helping crew will make your trekking journey memorable.